Argentina is making some interesting wines at the moment. Its main marketing push has been Malbec, a grape whose home is the southwest of France, where it’s the main grape in Cahors and a bit-part player in many Bordeaux blends. 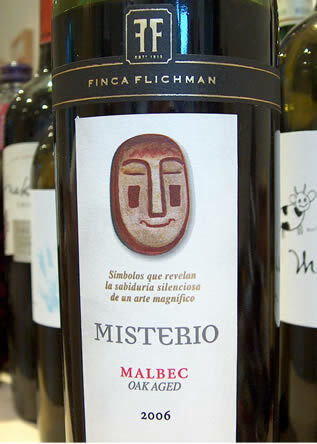 Malbec doesn’t have the blackcurranty fruitiness of Cabernet; rather it is a bit darker, and a little more savoury, with spice and earth undertones. It has less of a tendency to go to lushness when grown in warm climates, which is probably a good thing. Mendoza is the dominant wine region. Perched on the side of the Andes, this is a region that receives very little rainfall, and were it not for the ready supply of Andes meltwater, viticulture wouldn’t be possible here. Another important factor is altitude: the vineyards here are high up, and with the highest vineyards in the region the extra UV light that the grapes receives causes the grapes to develop thicker skins, with more tannins (and softer tannins, too), as well as more colour. The cooling effect of altitude means that the grapes preserve acidity even when they are allowed to hang for quite a while before harvest. But it would be wrong to dismiss Argentina’s other wine regions. Two in particular are worth mentioning. First, Salta. Up in the hot north, these are the world’s highest commercial vineyards: were it not for the effect of altitude, it would be too hot for quality viticulture here. Second, Patagonia. Travelling far south, this is a cooler, windier, flatter region that’s beginning to turn out some really nice wines. This tasting covered 45 different Malbecs, which sounds like a lot, but is only a quick sampling of a much broader offering. Some important wines are missing – Catena, Achaval Ferrer and Colomé, to name but three – and so this can’t be seen as a true ranking of Argentina’s best. In terms of quality, I though this was quite high across the board. Remember, this is a mixture of commercial wines and then some high-end ones. Stylistically, I think Argentina would do well to go down the road of freshness, definition and structure, rather than super-ripeness and new oak flavours. I would also add that while Argentinean Malbec is great, it would be a shame for this country to become a one-trick pony: other grape varieties shouldn’t be neglected in a headlong rush to plant Malbec. Bold, rich and quite oaky with lots of presence.